Ships on 06/17/2019. Pre-order today! Waterproof leathers and a seam-sealed construction on our modern hiker helps keep your feet dry and cozy in wet, cold weather. 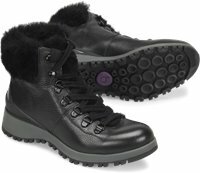 The ultra-plush shearling collar adds to the chic, cozy feel, making this lightweight boot a perfect choice for enjoying the outdoors and relaxing après ski with friends. I love my Diablo booties! They are super warm and comfy! I also love how lightweight and fluffly they are. A must-have in my closet.